On July 1, 1912, world famous aviator Harriet Quimby, and a passenger, William A. Willard, were flying in a two-seat Bleroit monoplane over Dorchester Bay towards Squantum Aviation Field when the aircraft was caught by a sudden gust of wind which lifted the tail and caused the aircraft to “nose forward” while 1,000 feet in the air. Both Willard and Miss Quimby were pitched from their seats and were killed when they hit the water. The airplane then turned completely over in the air and came down in the bay. The accident was witnessed by thousands who had come to the Boston Aero meet to watch the flight of several aircraft make their way to Boston Light and back. Ironicly, Mr. Willard wasn’t originally scheduled to fly with Miss Quimby. According to one report, newspaper photographer A. B. Reed was supposed to make the flight, but a change was made at the last minute. At the time of the accident the tide was low, and the water was only about five feet deep. The bodies of Miss Quimby and Mr. Willard were quickly recovered by men in motor boats, and transported to the morgue in the town of Qunicy. This was reported to be the first airplane crash fatality in New England. The incident gained national attention in the press for Miss Quimby had gained international fame in a relatively short time. 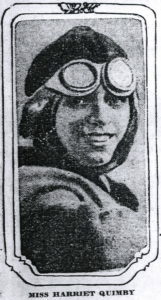 In 1911 she became the first woman to earn a pilot’s license from the Aero Club of America, and in April of 1912, the first woman to fly across the English Cannel. At one point she was hailed by the American press as being “the leading woman aviator of the world”. In May of 1911 Miss Quimby had survived an earlier plane accident while at the Moisant School in Mineola, New York, when the plane she was piloting fell ten feet and was wrecked. Miss Quimby wasn’t hurt. Mr. Willard was a widower, survived by two sons and a daughter. Much more has been written about the life of Harriet Quimby which can be found elsewhere on the Internet.